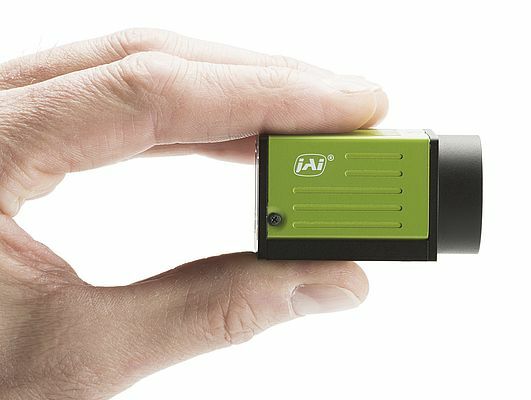 JAI launches the GO-5000M-PMCL and GO-5000C-PMCL, the first models in the Go Series, a new line of small, fast, and versatile entry-level industrial cameras. The new cameras are built around the same 5-megapixel CMOS imager featured in the company's high performance Spark SP-5000 cameras, but offer a smaller form factor (29 mm x 29 mm x 41.5 mm, excluding lens mount) and weigh 46 grams. The cameras deliver full 5-megapixel output (2560 x 2048 pixels) at up to 107 frames per second over a two-channel, Power-over-Mini-Camera-Link interface. The cameras' combination of 5 micron square pixels and versatile ROI capabilities, enable them to be easily configured to meet a wide range of customer requirements for resolution, speed, and optical formats. For example, by creating a centered 1920 x 1080 ROI, users can configure the GO-5000 to provide high-speed 1080p HD video that fits completely within the optical format of a 2/3" C-mount lens. This is in contrast to CMOS cameras with 5.5 micron pixels which generate 1080p image sizes that are slightly larger than the standard 2/3" optical circle, thus requiring more expensive 1" image optics to ensure that vignetting will not occur.